George Billis Gallery is pleased to present the gallery's eighth solo exhibition of works by still life painter Tom Gregg. The exhibition features the artist's recent works and continues through December 20th. This most recent body of work is inspired by Tom Gregg's fascination with objects and the powerful resonance that they have in his world. It is their association with the people who acquire them which gives power and energy to their presence. He adds, "It is the existence that they possess of their own, their own "life" in the universe of objects and the world itself, that is even more mysterious and beguiling." 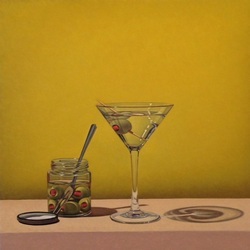 He attributes his pursuits as a still life painter to his respect and connection to objects and their perceived world. However, the actual objects depicted in the paintings are primarily there to fulfill the formal demands of the painting itself. He states, "Any symbolic or metaphoric intention is subservient to the formal demands presented by the specific needs of each painting. I am trying to hit a particular visual note through the combined actions and interactions of the formal elements in the painting." Tom Gregg received his B.F.A. in Printmaking from the Rhode Island School of Design and his M.F.A. from Yale University School of Art. His work has been featured in many distinguished publications including: American Art Collector, Art & Antiques, The Kansas City Star, and New York Magazine. Gregg lives and work in Kansas City, MO.